Both the full and half marathon have a flat and fast course, making it a popular option for runners hoping to set a PR or earn a spot in Boston. The race is chip-timed, has a corral start to eliminate bottlenecks, and has 17 aid stations, staged approximately every 1-2 miles. In addition to fueling your body, the Eugene Marathon also helps fuel your spirit with 14 musical entertainers throughout the course, and a free concert by Eleven Eyes at the Finish Festival Stage. For those who prefer a shorter run, race weekend also includes a 5k. This race is fast and fun, and it makes a big impact despite its short distance. The Eugene 5k is partnering with Court Appointed Special Advocates of Lane County (CASA), a group that trains and supports volunteers to advocate for children in the foster care system and help them move to safe, permanent homes. A portion of registration fees go to benefit this cause, and runners can fundraise directly for CASA to increase their support. Additionally, the 5k provides an extra challenge in the form of two special guests: Flap Jack and Flap Jill, the world’s fastest pancakes. Any runner who can beat the pancake wins a year’s supply of Krusteaz buttermilk pancake mix, and for every runner who doesn’t pass the pancakes, Krusteaz will donate $1 to CASAs. In a race like this, no one loses! Since the Eugene Marathon is a family event, kids can race in the 1k Duck Dash. 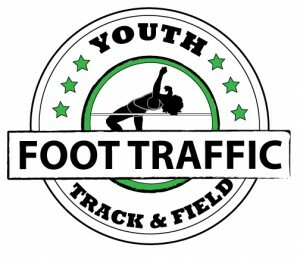 Participants must be between ages 4-12 on race day, and runners under 6 must have an adult running with them. Kids will have the full race experience, complete with a short sleeve shirt, medal, reusable water bottle, official tracking, and training plans. Racing should be available to everyone, and the Eugene Marathon makes every effort to prevent price from being a barrier to entry. Participants can race for free if they earn sufficient donations to charity ($175 for the full or half marathon and $75 for the 5k). Not only do the organizers of The Eugene Marathon recognize that sometimes runners need a boost on the road, but they also recognize the importance of helping runners off the road. 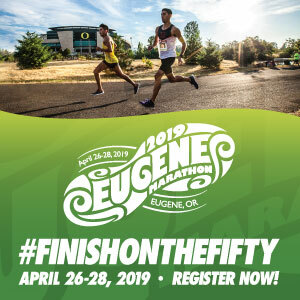 The Eugene Marathon gives scholarships to two high school seniors who demonstrate excellence academically, athletically in cross-country or track & field, and as members of the community. Scholarship applications must be submitted no later than February 28, 2019, and recipients will be honored during marathon weekend. The Eugene Marathon offers a gorgeous course that is both steeped in history and mindful of the future. While you may be inspired to run in the footsteps of legends, you will also have a legendary experience all your own. Cost: Prices noted for registration at the Expo. Discounts are given for early registration. Charity Fundraising – free admission to race for fundraising $175 for half or full marathon, or $75 for 5k.